The Wall That Heals is a half-scale replica of the Vietnam Veterans Memorial in Washington, D.C. It will be on display on the LBJ Presidential Library plaza Friday, April 22 through Thursday, April 28. It will be open 24 hours a day. In addition to The Wall That Heals, there will be a mobile education center and information tent. Information cases in the education center display photos of service members whose names are found on The Wall, along with letters and memorabilia left at memorial in Washington. The center also includes a map of Vietnam and a chronological overview of the conflict in Vietnam. The exhibits in the center tell the story of the Vietnam War, The Wall, the era surrounding the conflict, and are designed to put American experiences in Vietnam in a historical and cultural context. 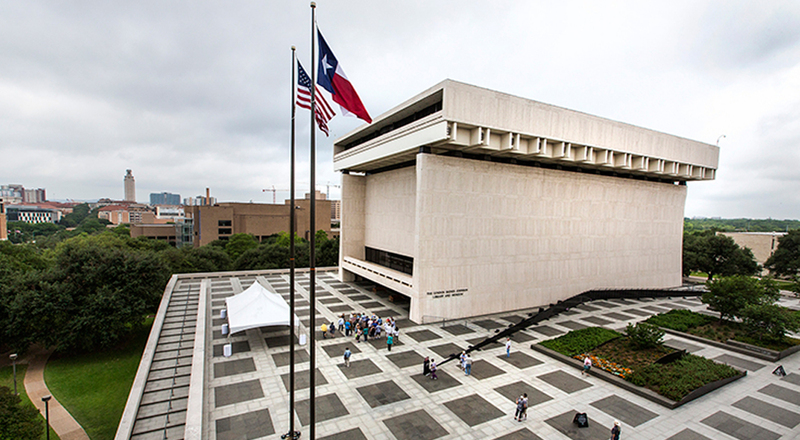 While you're visiting The Wall, we invite you to visit the LBJ Presidential Library. We will be offering free admission to all beginning April 19 through April 28. We are open 9 a.m.-5 p.m. every day, except for Wednesday, April 27 where we'll close at 4 p.m. If you're visiting The Wall That Heals, free parking will be available in the LBJ Library visitors' lot (#38), located on Red River Street between Dean Keeton and Clyde Littlefield Drive. Please let the parking attendant know you're visiting The Wall. Note: We anticipate hundreds of visitors to The Wall daily. This parking is limited and on a first come, first served basis. Interested volunteers may sign up at http://vols.pt/MphGQc. You may sign up for one or more shifts. For questions or more information, please contact volunteer@lbjlibrary.net. The Wall That Heals is approximately 250 feet in length, and like the original memorial, is erected in a chevron-shape. The replica is constructed of powder-coated aluminum, supported by an aluminum frame, and is made up of 24 individual panels. As on the original memorial, the names on The Wall are listed by day of casualty. Beginning at the center/apex, the names start on the east wall (right-hand side) working their way out to the end of that wing, picking up again at the far end of the west wall (left-hand side) and working their way back in to the center/apex, joining the beginning and end of the conflict at the center. Panel numbers are on the bottom of every panel. Names are arranged alphabetically by date of casualty, beginning at the center apex with panel IE (under 1959), down panel 1E, then moving right towards 70E, then from 70W towards the center, and ending in the middle on 1W. The first and last casualties are side by side at the heart of the memorial. Line numbers count down from the top of each panel. On the edge of every other panel are white dots every 10 lines. Count down 4 dots and you’re on line 40. How many names are listed? There are currently 58,307 names on The Wall which includes both KIA and MIA. There are still more than 1,600 service members unaccounted for from the Vietnam War. The Department of Defense compiled a list of combat zone casualties according to Presidential Executive Order #11216, handed down by President Lyndon B. Johnson on April 24, 1965. It specified Vietnam, and adjacent coastal waters, as a combat zone. This zone was later expanded to include Laos, Cambodia, and Air Force bases in Thailand. Name rubbings cannot be done on The Wall That Heals, but The VVMF would be happy to send you an authentic rubbing from The Wall in Washington, D.C. Please visit the Information Tent for Name Rubbing Request Forms. How can you find a name, if the listing on The Wall is not alphabetical? You must refer to a database, which gives the names in alphabetical order and includes the position of each on the memorial. This can be in the form of a book, The Vietnam Veterans Memorial Directory of Names, or one of various databases. The directory can be purchased by calling (202) 223-6706. You also may search VVMF's online database. Who determines how names are added to The Wall? The VVMF receives numerous requests each year from individuals who want to have particular names placed on the memorial. And while VVMF finances the addition of names on The Wall, they do not determine whose names are to be inscribed. It is the Department of Defense that makes these difficult and often very technical decisions. The VVMF does not have the authority to overrule those who adjudicate these matters. The policy is that only those persons who died of a combat injury suffered in Vietnam be added to the memorial. If you would like a more detailed explanation of the parameters for inclusion, please contact the relevant service branch. The VVMF stresses that the memorial stands to honor all who served in Vietnam, not just those whose individual names it bears. Are there any women's names on The Wall? The names of eight women, all nurses (seven from the Army and one from the Air Force) are inscribed on The Wall. How many Medal of Honor recipient's names are on The Wall? The names of 151 Medal of Honor recipients are on The Wall. How many chaplains are on The Wall? There are 16 total clergy (seven Catholic, seven Protestant, and two Jewish) listed on The Wall. Are there any names of persons with foreign homes of record? There are 120 persons who listed foreign countries as their home of record (this is not place of birth or actual residence necessarily, but sometimes place at which the person wanted to be discharged). The countries include: Australia, 1; Bahama Islands, 1; Bolivia, 1; Brazil, 1; Canada, 56; Colombia, 1; Costa Rica, 1; England, 3; France, 2; Germany, 7; Ireland, 17; Italy, 1; Jamaica, 2; Japan, 2; Mexico, 5; New Zealand, 2; Pacific Island, 1; Panama, 2; Peru, 1; Philippines, 27; Puerto Rico, 1; Switzerland, 1. Are there names of people on The Wall who are still alive? Yes. There is no definitive answer to exactly how many, but there could be as many as 38 names of personnel who survived, but through clerical errors, were added to the list of fatalities provided by the Department of Defense. One person, whose name was added as late as 1992, had gone AWOL immediately upon his return to the United States after his second completed tour of duty. His survival only came to the attention of government authorities in 1996. His name has been removed from the Directory of Names; however, it cannot be removed from The Wall. Header image: The Vietnam Veterans Memorial Fund, Adam Arbogast.